It excites me to be able to celebrate the big 4 with you today! My 4th FODMAP-iversary that is! The Melbourne Cup Weekend marks the beginning of my FODMAP life. I vividly remember beginning that long weekend in tears on the kitchen floor but ending it with less of a wet face and more of a half smile. When I first began, I couldn’t foresee getting through those first few sad and hungry days, let alone years. It took me months to even begin to get a handle of this new way of life. But, with the support of my family, I was able to get through to the other side of that long weekend with high hopes (and probably a lot of boiled eggs and rice crackers), and my little half smile. Now looking back, it feels somewhat like I’ve never been on a diet at all. This is just my usual way of life, where I plan my life around food and my food around life – pretty much the way it has always been. My love of food keeps on growing, and the restrictions continue to motivate me to be more and more adventurous in the way I cook, source my food, and of course, in the way I eat! While my diet today still consists of boiled eggs and rice crackers, it has transformed completely from those (what felt like) horrid initial months. Where there was plain poached chicken, boiled potatoes and white rice, there is now this. Where there were dry gluten free cupcakes from the box, there are now these. However boring it may seem, we all must go through this initial strict stage. Committing to this strict low FODMAPs stage is challenging but it allows our poor, upset tummies to start to heal, and is well worth it in the end! I say this all the time, but going on the FODMAP diet has allowed me to feel the best I’ve ever felt! 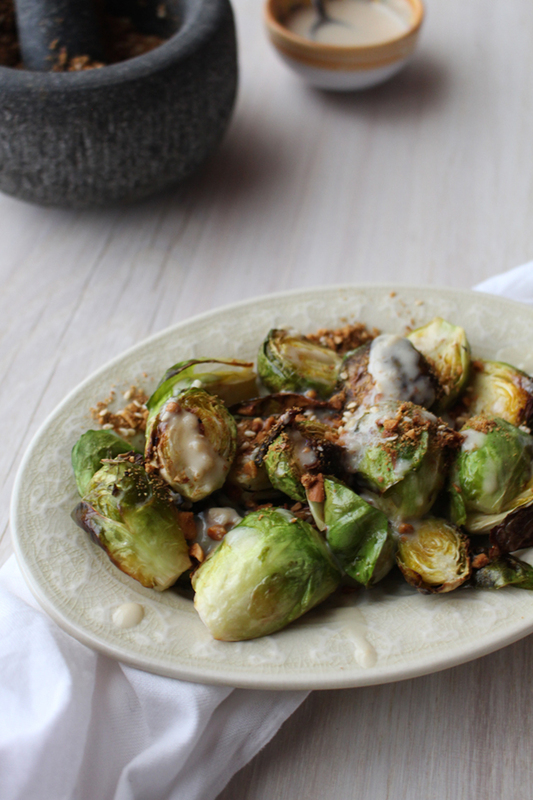 The star ingredient is Brussels sprouts – though not strictly low FODMAP (let’s call them mediums), I know I can tolerate them in small amounts. 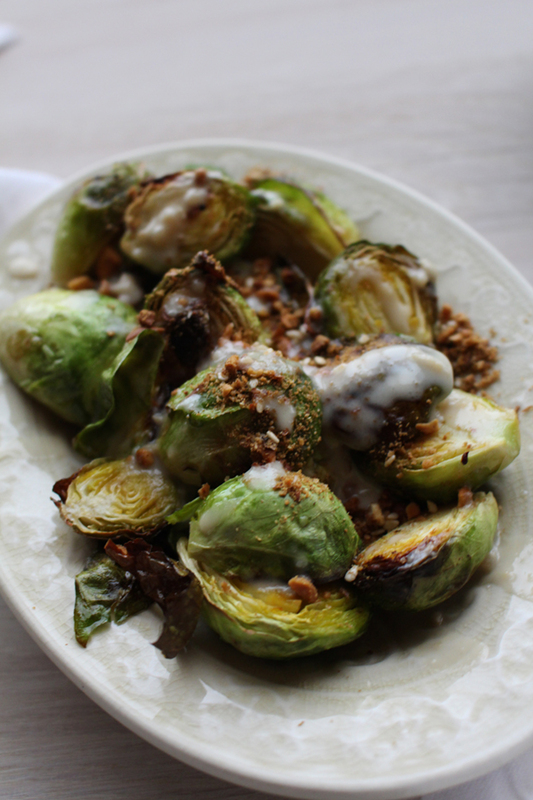 Brussels sprouts are packed with nutrients and are an especially great source of vitamin C, vitamin K and dietary fibre. 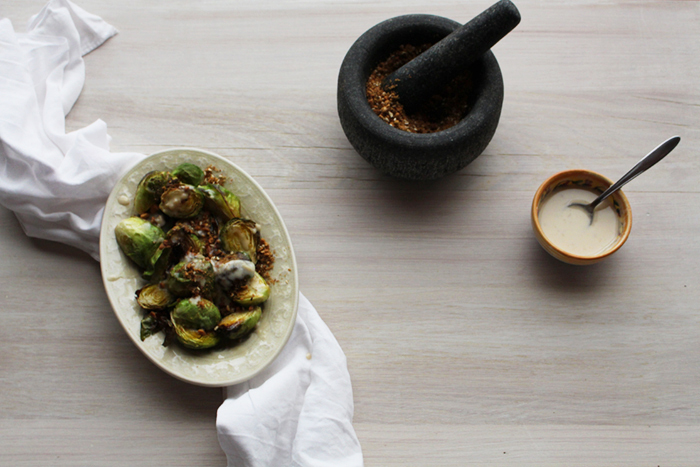 The recommendation for the low FODMAP diet is half a cup, which equates to roughly 3 Brussels sprouts. The second star ingredient is the latest trial in my diet – Garlic Infused Olive Oil! It is considered a safe low FODMAP food, however personally, I have stayed away from anything garlic for the full 4 years because I went off the taste! Until today, that is. When I saw this beautiful local and organic olive oil from the Grampians Olive Co I had to give it try and it didn’t disappoint. A beautiful product, and pretty good on the tummy! So really, this recipe, in moderation should (in theory) be perfectly okay for all low FODMAPPers. Obviously everyone is different, and different factors can effect how we feel on certain days, but I think we sometimes forget to eat the ‘limited’ FODMAPs and over restrict ourselves, we forget to trial and test, or just avoid doing it completely. Let this be a little push to get testing and enjoy as many foods as you can! Preheat oven to 180C. 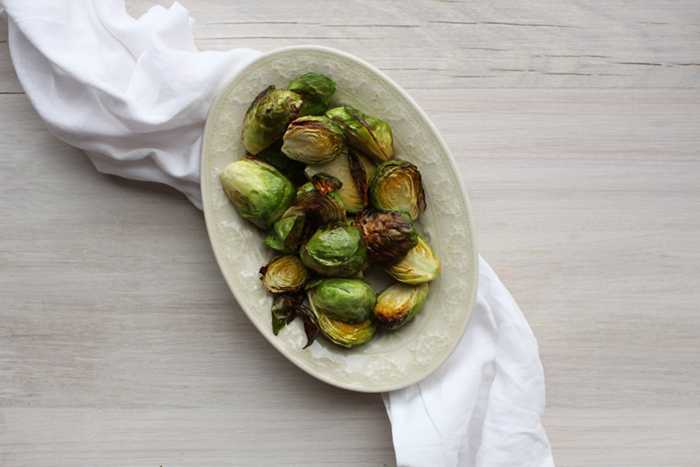 Place Brussels sprouts in a baking tray with olive oil and salt, and roast for approximately 30 minutes. 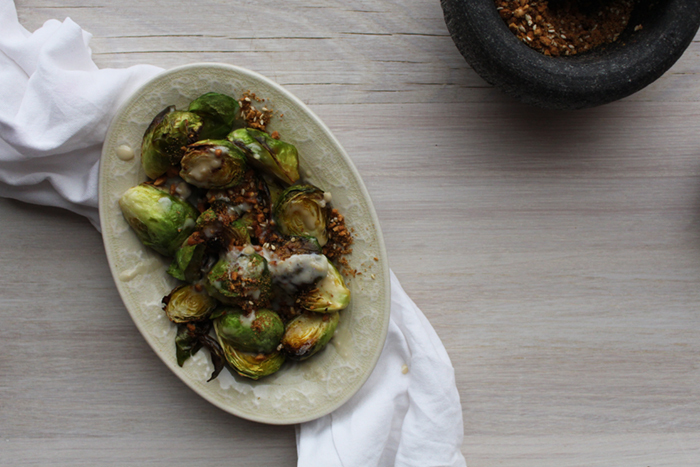 Meanwhile whisk together garlic infused olive oil, tahini, maple syrup and lemon juice in a small bowl, set aside, and prepare the dukkah. 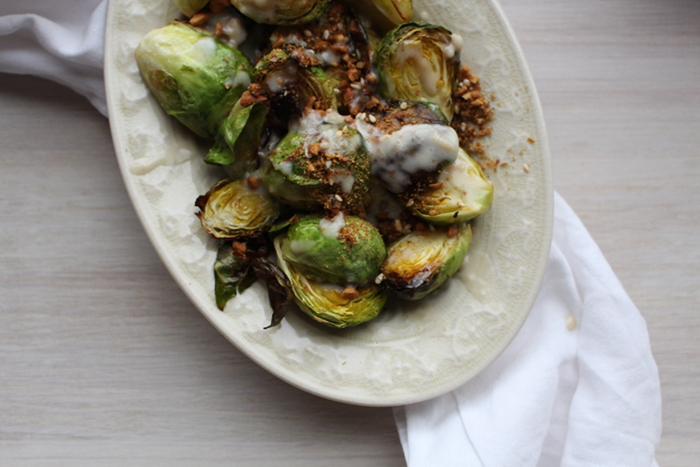 Remove Brussels sprouts from the oven and top with dressing and a sprinkle of dukkah. 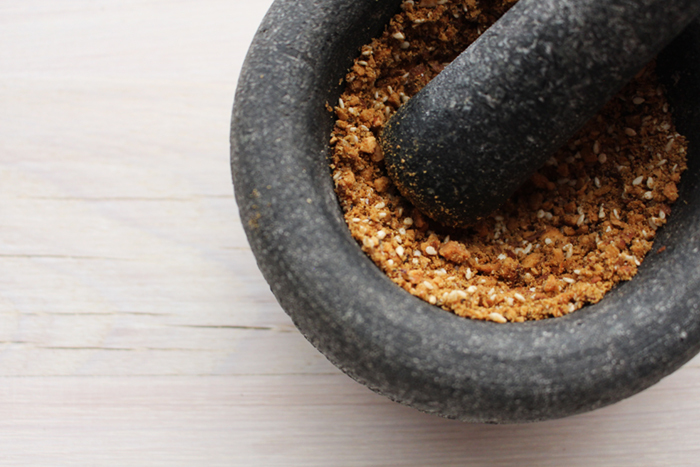 Dukkah: Crush toasted hazelnuts and almonds in a mortar and pestle. In a small saucepan, toast sesame seeds, cumin and coriander for a minute or until fragrant. Add to the nuts, along with salt and pepper, and lightly grind to combine the flavours together. Store leftovers in a small jar.